On April 19 this year, in anticipation of an adverse ruling by the UN tribunal at The Hague known as the Permanent Court of Arbitration, that was delivered on Tuesday, the Chinese embassy in New Delhi, as part of a global diplomatic offensive by Beijing, had invited some scholars from various think tanks in New Delhi to a presentation on China’s claims to the South China Sea (SCS). The officiating Chinese ambassador ended the presentation by saying that should India back the Chinese position on the South China Sea, Beijing could accommodate New Delhi on the McMahon Line in the Himalayas, where both nations have an ongoing decades-long border dispute. He then said: “Someone in future may dispute the ownership of the Andaman and Nicobar Islands.” In May 2016, when an Indian maritime think tank visited China for discussions, the Chinese hosts, discreetly and “off the record”, reiterated that in “future the Andaman and Nicobar Islands could be disputed by someone”. China’s claims on the SCS apparently rest on a 600-year-old book, The Book of Maritime Routes, which was used by Chinese fishermen from Tanmen in Hainan island (that is now a major Chinese naval base) to “sail, navigate and fish” in what they called their “ancestral sea for over 3,000 years”. China’s claims to about 90 per cent of the SCS were first promulgated on a 1947 map showing a “9 dash line”. In 2013, the Philippines, after 17 years of fruitless talks with China over the disputed Scarborough shoal (located 555 miles from China’s Hainan island and only 137 miles from the Philippines) had asked the UN tribunal to adjudicate on China’s claims in the SCS. 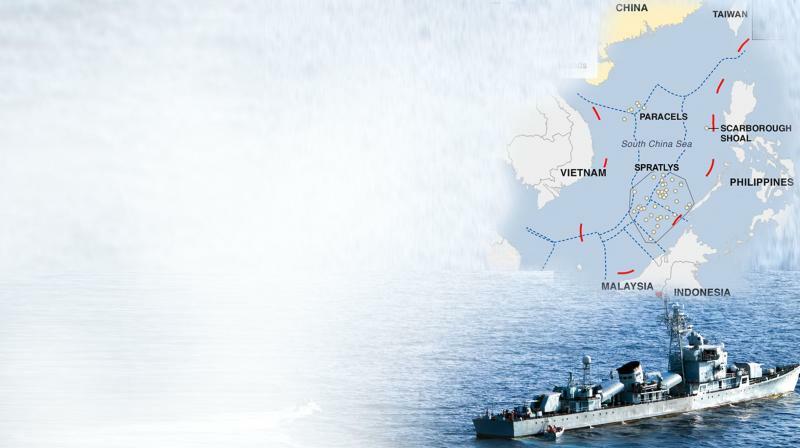 Between July 3 and 11, 2016, over 100 Chinese Navy warships and over a dozen fighter aircraft conducted live fire military drills in the tense SCS, which is already teeming with warships and coastguard ships of rival claimant nations. After the verdict delivered on Tuesday by The Hague tribunal, India should diplomatically and without much publicity support “freedom of navigation in the SCS” and insist that China, a signatory to the 1982 UN Convention on the Law of the Sea, accept the verdict of the Permanent Court of Arbitration, which ruling concluded “that there was no legal basis for China to claim historic rights to resources within the sea areas falling within the 9 dash line”. China has, not surprisingly, described the tribunal’s ruling as “ill-founded”. Given its single coastline and the wartime possibility of its access to the sea being blocked by three chains of islands and the Malacca Straits, China, in a clear attempt to emerge as a global superpower, is up to some mischief. Apart from funding and building the Pakistani port of Gwadar, which it is now expected to convert into a Chinese naval base, and beginning work on the China-Pakistan Economic Corridor (CPEC), which passes through Pakistan-occupied Kashmir, as an essential ingredient of China’s One Belt One Road (OBOR) initiative, China may make a future claim to India’s Andaman and Nicobar Islands, based on the seven voyages (1405-1433) to the Indian Ocean region by the legendary Chinese admiral, Zheng He, who on his death in 1433 was accorded a sea burial off Kozhikode in India. Admiral Zheng He opened the famous Maritime Silk Route (MSR) by sailing through the Malacca Straits, visiting Thailand, Sri Lanka, Kerala, the Red Sea and the Persian Gulf. His fleet comprised 300 ships and 28,000 sailors, and ensured that the MSR was linked to the fabled Chinese Land Silk Route (LSR), which carried goods to Europe. At some future date of its choosing, the Chinese government is quite capable of producing a “new, just-found 700-year-old document” that would purport to show that Admiral Zheng He had visited the Andaman and Nicobar Islands, in support of China’s claims to these islands. In 2015, China began work on the OBOR, which is basically a revival of the ancient Land Silk Route and Maritime Silk Route. The China-Pakistan Economic Corridor is an essential ingredient of the OBOR, and hence Pakistan has become an indispensable strategic ally of Beijing, which indirectly supported Islamabad by blocking India’s entry into the 48-nation Nuclear Suppliers Group (NSG) in June. However, India, by becoming a member of the 35-nation Missile Technology Control Regime (MTCR), can “quietly” oppose any Chinese attempts to enter the MTCR (China’s application to enter the MTCR was made in 2004). The South China Sea is rich in fish, seabed minerals, oil, gas and has over $5 trillion worth of ship-borne commerce sailing through it annually. India relies on the sea for 90 per cent of its imports and exports, and 50 per cent of its seaborne trade passes through the disputed SCS. Hence, freedom of navigation in the SCS is vital for India’s economic growth. At present, India is somewhat vulnerable as two critical items have to be imported from China, and hence it has no choice but to maintain cordial relations with Beijing while not compromising national interests, as it tries to improve the indigenous production of both. The first is Rare Earth Elements (REEs), comprising 17 rare elements, which are difficult to locate, mine and process, and on which India is totally dependent on China. These are crucial for several industries and defence applications. Today, China makes about 97 per cent of the global REE output. I had earlier written about the significance of REEs in this newspaper on August 31, 2012 (A doctrine of no use). The second critical item that India imports from China was mentioned in Patralekha Chatterjee’s June 29, 2016 article in this newspaper (Targeting of China is not a great idea) — these are Active Pharmaceutical Ingredients (APIs), or bulk drugs necessary to produce medicines in India. India needs to focus on economic growth. At the same time, it must deter any Chinese or Pakistani misadventure by tweaking its Nuclear No-First-Use doctrine to ensure that it actually deters the buildup of any blue-water navy that can operate in the Indian Ocean region as well as in the Western Pacific Ocean.